If you want the real taste of a place, you can find it on the street. Street foods are cheap, authentic and you can eat it conveniently while strolling around the place. In order to show you the real taste of Bagan, here is the list of top 5 street foods you must try in Bagan. Fried chicken can never be wrong. But I bet you never have fried chicken like this. It is originated from Lat-Pan-Pyar village, 45min drive from Meik-hti-Lar on Meik-Hti-Lar to Kyouk-Pa-Daung Road. Near the village, you can see the ladies with trays of fried chicken on their head. Completely organic chickens are raised in nature. So, the meat is naturally sweet and tender but dense and no blood smell. It has much less fat than other species. The cleaned chicken parts are seasoned only with salt and skillfully fried in low temperature. Though they are not boiled and there are no electrical automatic fryers, the meat is thoroughly cooked till the bone. The outside is crispy and inside tender. After thoroughly draining the oil, the delicious fried chicken is served. Although no preservatives are added, you can take away in room temperature for days without going bad. It can be eaten as original, together with rice and even in salad style. 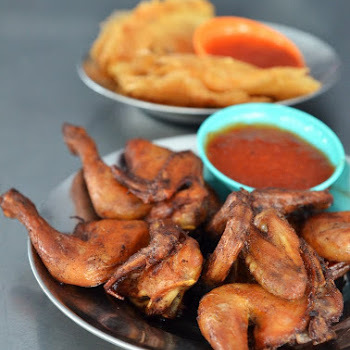 Therefore, if you are in Bagan, don’t forget to try this amazing versatile fried chicken from Lat-Pan-Pyar village. This nectar of god is naturally formed in flowers of palm. Though it is cheap, the collector is betting his life on 25m trees. There are 2 kinds of palm juice: sweet fresh one which can be made into palm jaggery and slightly fermented one which is sour and drink as a weak fresh wine. The sweet juice is like an oasis beverage for hot temperature of Bagan. The palm wine is a little alcoholic but no damage to heath since it was naturally fermented only for few hours. You can also enjoy the natural candy jaggery which has deeper taste than cane sugar. The most famous places for palm juice are ‘Pi’ palm field and Anyar-Lat-Saung palm field. At there, you can enjoy the cool fresh palm juice with various snacks under the gourd vines or on a tree house. Even if you stay in Bagan for only one day, don’t miss this. Do you think that Myanmar cuisine is all about curry, stew and soup served in many plates? Well, here is Myanmar salad which you can enjoy all the wonderful things in one plate without setting up the grand dinning. This savory healthy dish based on crispy fried onion, tamarind sauce, baked chili flakes and the signature ingredient of Bagan, freshly baked pea powder. From all kinds of noodles to all kinds of vegetables you can ask, that mixture will make it delicious. Sweet, sour, savory, spicy tastes are delightfully seasoned by powdered prawn and homemade fish sauce for deeper taste. So, if you want a snack customized for you or you are on budget, make your way to a Myanmar salad shop. The best ones in Bagan are Daw Mhat Kyi’s salad at New Bagan and Daw Hla Than at Nyung Oo. No deep fry, no street food. Forget about your diet and have this crispy joy just under one dollar for 10 pieces. A variety of ingredients such as prawns, gourds, beans, peas, potatoes, corns, onions, pumpkin, chayote, pennywort, bamboo shoot are dipped in freshly made rice batter and deep fried in fragrant peanut oil. The sweetness of ingredients is combined with the crispiness of outer skin. Freshly made sour and spicy tamarind dipping sauce will make you want more & more without greasy feelings. So, if you want a break and a tea time snack on your way of enjoying Bagan, remember that delicious fritters are waiting for you near Shwe Si Gone, Shwe San Taw and Hti Lo Min Lo pagodas. Sometimes, good things come in small size. Yes, this heartwarming street food is bite-size but it can give you the best taste of pork in your life. The well marinated pork is boiled for a long time in sweet broth. Then it was cut into bite-size pieces and put on stick. If you want to eat this, sit in front of the broth pot, say any part of pork you want, grab the stick, blow it to cool down, dip in garlic-chili sauce and have it whole. For the companion carb, stir-fried vermicelli is ready along with the lemon squeezed meat broth. The only place in Bagan which sells this delicious food is in front of Kandotpalin temple. So, stop your track for a moment to eat this cute little thing. If you want to try all of above shops or if you want an awesome trip of Bagan, just click on https://www.greenmyanmar.com . We are always ready to serve you for your customized happiest trip to Bagan.